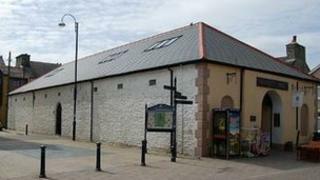 A 19th Century market hall is to receive a £350,000 revamp as part of a scheme to help regenerate Aberystwyth. The facelift includes new stalls inside, while outside four starter units will be built for new businesses. Some traders will remain in the market while the work takes place, but most have been relocated to shop nearby. The revamp is jointly funded by the Aberystwyth regeneration fund, Ceredigion council and the Rural Development Plan for Wales. There has been a market on the site in St James Square for nearly 200 years, but the current building was built in the 1890s. The work to refurbish the building is expected to be completed in April. Gareth Lloyd, Ceredigion council cabinet member for economic development, said: "The joint funding package will provide a renovated market hall and the new incubators which will encourage much needed new business start-ups in the town." The Welsh government named Aberystwyth as a regeneration area in October 2009, and it was awarded £10.3m in March 2010. Projects which have benefited from the fund include a new circular road linking Aberystwyth University and the National Library of Wales, along with a new bus service. Meanwhile, a scheme improving access to the town's railway station and an area for buses has received £1m from the fund.